The Verint Media Recorder is part of the Impact 360® for Public Safety™ suite of workforce optimization solutions from Verint® Systems. 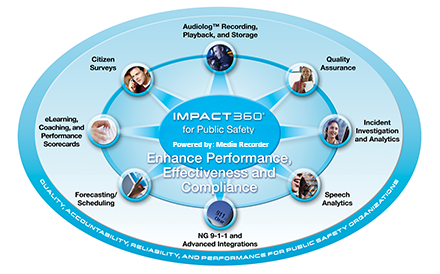 Impact 360 for Public Safety combines multimedia recording, searching, playback, and storage with functionality for quality assurance, incident investigation and analysis, speech analytics, workload forecasting and staff scheduling, employee coaching and training, and citizen surveys to help agencies and public safety answering points enhance performance, minimize liability, and meet new challenges arising from NG9-1-1. The Media Recorder is part of Verint’s Impact 360 for Public Safety, a robust portfolio for improving the effectiveness of PSAPs and emergency communications/command & control centers. No one understands the challenges facing public safety organizations better than Verint. And no one provides a richer portfolio of solutions for increasing situational awareness, improving emergency response, reducing liability, and expediting investigations. Capturing audio, video, text, screen data, telematics, photos, and related data, such as telephone numbers and locations, from a variety of sources. Live monitoring public safety answering point (PSAP) interactions to help ensure adherence to policies and procedures. Documenting and reporting results efficiently. Verint Media Recorder provides PSAPs with full-time recording, selective recording, recording on demand, and dial-in recording across digital and analog telephones, trunked and conventional radio systems, telephone lines and trunks, IP phones, short message service (SMS), and PC screens. It can record screens while minimizing network usage and storage requirements and can capture screen changes, including mouse movements and keystrokes, without disrupting call handlers. In addition to recording interactions, Media Recorder can tag them with information from radio, ANI/ALI, CTI, ICCS, CAD, SMS, and GIS systems to facilitate incident reconstruction. Authorized personnel can monitor multiple channels or calls from their desktops in real time and play back contacts in just seconds, helping to quickly confirm details and review conversations that were difficult to understand. With the Verint Media Recorder. you can retrieve captured interactions according to a wide variety of criteria, from date and time to caller ID, call taker name, DNIS, CAD incident number, radio ID, talkgroup or ANI/ALI. 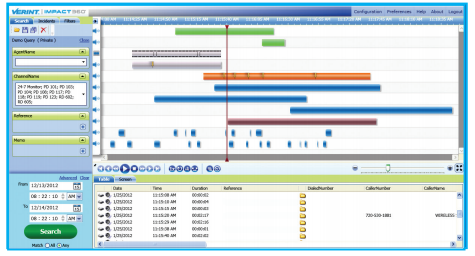 You can also take an incident-based approach, reconstructing events and scenarios by playing back multiple interactions simultaneously, all from a single workstation. To help secure recordings from unauthorized access, you can assign playback and monitoring rights to each user by channel, individual, and talkgroup. A playback audit trail can track unauthorized incidents, alerting you to potential abuse. For added security, digital fingerprinting shows when a voice or radio recording has been tampered with, while optional AES-256 encryption protects voice and radio data. Verint Media Recorder can retain large volumes of calls online, as well as archive contacts to Blu-Ray media, DVD-RAM, and network-based storage resources. These flexible storage options offer ongoing access to interactions and data, enabling you to review actions and assess performance over time. To help facilitate compliance with industry standards and government mandates on call handling evaluation, Verint offers Media Recorder Interaction Quality™, an easy-to-use quality assurance solution. Media Recorder Interaction Quality is a best-of-breed solution for measuring, analyzing, documenting, and improving the performance of call takers and managers. It’s especially helpful for training staff on systems and processes arising from NG9-1-1. Verint Media Recorder Interaction Quality uses point-and-click templates to simplify the creation of evaluation forms and questions. Its intuitive, browser-based interaction assessment tool enables managers to play back and score calls easily, with only minimal training. A unique calibration feature can measure and compare quality evaluators’ scores, showing how they deviate from averages or goals to foster more consistent scoring across your organization. Media Recorder Interaction Quality also provides comprehensive reporting, making it easy to analyze the performance of call takers and managers. 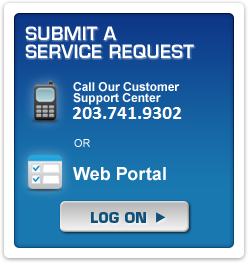 You can choose from a variety of standard reports or customize them to meet specific requirements. You can also view reports on-screen, export them into formats that can be emailed as attachments, print them on demand, or even set up a schedule to deliver reports automatically via email. This can reduce administrative burden while fostering information sharing. Verint Media Recorder is designed for use both as a stand-alone recorder/playback unit and as a specialized recording server within a networked environment. To promote superior reliability and availability and cost-effective operation, Media Recorder is built on an open architecture and uses standard PC components, the Microsoft Windows platform, and the Microsoft SQL database. This helps free your organization from the cost and complexity associated with proprietary systems while promoting compliance with commercial off-the-shelf requirements imposed by many municipalities and governing agencies. For more information about Media Recorder & Interaction Recording, please contact us.